Australian War Requiem 2018 – Welcome | Sydney Sings! Sydney University Graduate Choir invites singers from other choirs to join us in singing this magnificent work in November. This original work, by Australian composer Christopher Bowen OAM, had its world première in August 2014 at the Sydney Town Hall. That performance by the Sydney University Graduate Choir and Guest choristers was met with great critical and audience acclaim. The deeply moving libretto written by Pamela Traynor draws on correspondence between mothers and their sons on the battlefield. Together with the masterful musical composition, the AWR is a stunning and moving piece that commemorates the Centenary of the Great War. As the première commemorated the outbreak, this year’s performance will commemorate the end of that war, with the performance on the centenary of the Armistice, 11th November. 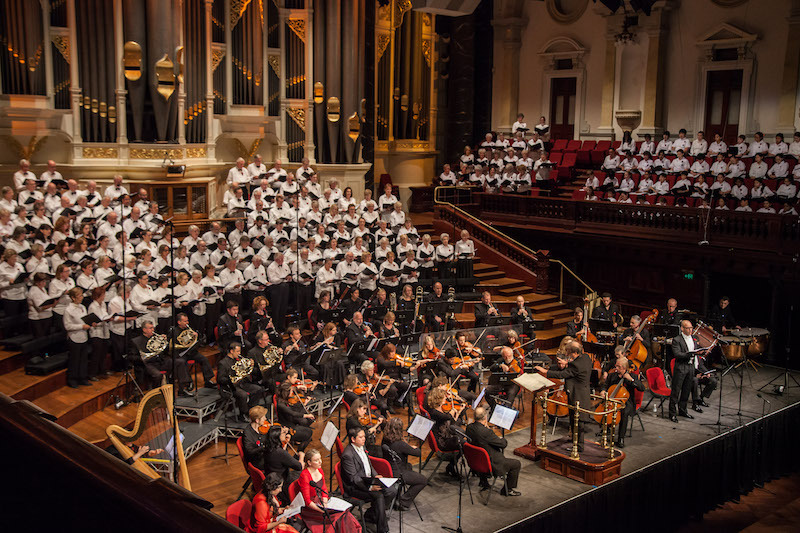 As part of the Sydney Sings series, the November 2018 performance provides an opportunity for choristers from across Sydney and NSW to join the Sydney University Graduate Choir, soloists and a full orchestra in performing the Australian War Requiem at the Sydney Town Hall. Many of those people who sang in the 2014 performance are very anxious to sing the work again, as are those who have sung with us in other great choral works. If you are interested in singing with us, please go to the Information and Registration pages, where you will find the details of how to join us and what is involved : score, learning aids, rehearsals and fees. We look forward to sharing this great musical experience with you!